A Brush With The Law: A Flair For Art Inspiring Wellbeing In Local Learning Centre. Who knew we had a budding Picasso among us? CSO Jeff Dugmore, who works at Blackwood Station, has been spending his free time over the last few months, painting a mural on the wall at the Markham Resource centre. The large, brightly coloured creation is all from his imagination and has already proved a hit with the day visitors to the centre. The resource centre in Markham used to be the Police House in the village and was purchased by Caerphilly County Borough Council in 2013. The building has since been converted and now provides day opportunities for people with learning disabilities. The people who access Markham are involved in activities within the local community including craft classes, archery and community education. There is a sensory garden in the grounds, which is maintained and used by members of the community, including the local primary school. It seems this is just the beginning of Jeff’s artistic career. Having seen the impact his wonderful work has had on the visitors to the Markham centre, he has been approached by Caerphilly County Borough Council to consider another project. 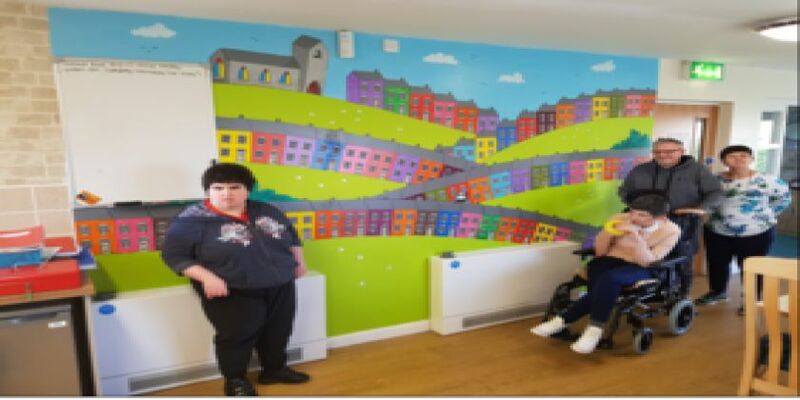 The Manager of Markham Community House and Sports Centre and the local councillor for Argoed ward would like him to paint another mural on the wall at the Community House, involving the help of local schoolchildren. Let us hope he doesn’t hang up his uniform to become the next Banksy anytime soon.